More Great Art for Kids! 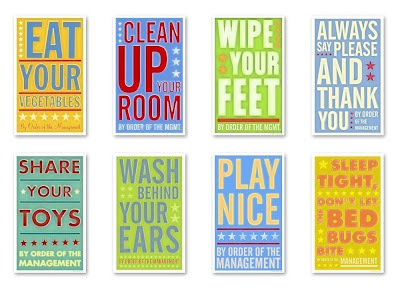 I think this set of signs, done by Digital Art by John W Golden, would look so fantastic in a playroom or boys room! Very cheeky. Framed in simple white or woods frames (whatever goes with your furniture) and hung in a series they would be both funny and TRUE!